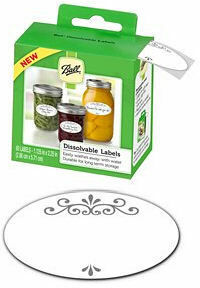 The Ball Brand Dissolvable Labels are made to adhere securely on jars during storage & use, and then dissolve easily away in water during cleanup. Labels strongly adhere to jars, are easy to write on and dissolve by hand washing or dishwasher when you're ready to reuse the jar. The box may also be used as a dispenser. Each box contains 60 dissolvable labels.